If you enjoy winter, the Enchanted Mountains is the place for you! The Town of Ellicottville is known as the "Aspen of the East" as it contains Holiday Valley Resort & HoliMont which are the areas two largest ski resorts. Enjoy the feeling of a ski resort and a quaint village all rolled into a unique setting that is for the consummate skier and non-skier alike. Whether you're a beginner or an expert, there are slopes for any skill level. For beginners, check out the Holiday Valley website to get complete information about lesson times and availability. 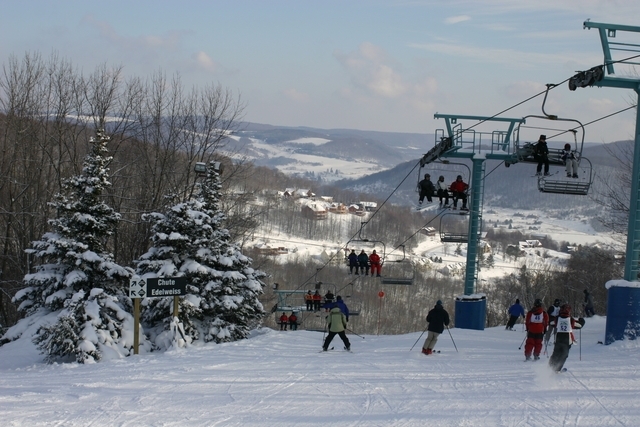 Holiday Valley was ranked #3 by for ski resorts in the East by Ski Magazine (2015). It boasts a 750 foot vertical drop with 58 day slopes and 37 night trails, all accessed by 13 high-tech lifts. Lessons are available from a variety of outfitters. Holimont is North America's largest private resort, but offers weekday skiing for anyone! They also include racing for members, and ski schools. Holimont gives you 52 slopes covering 135 acres, surely enough to keep you busy! Over 450 Miles of state funded snowmobile trails, including 69 miles within Allegany State Park.